Please click here to listen to Sound Bites. 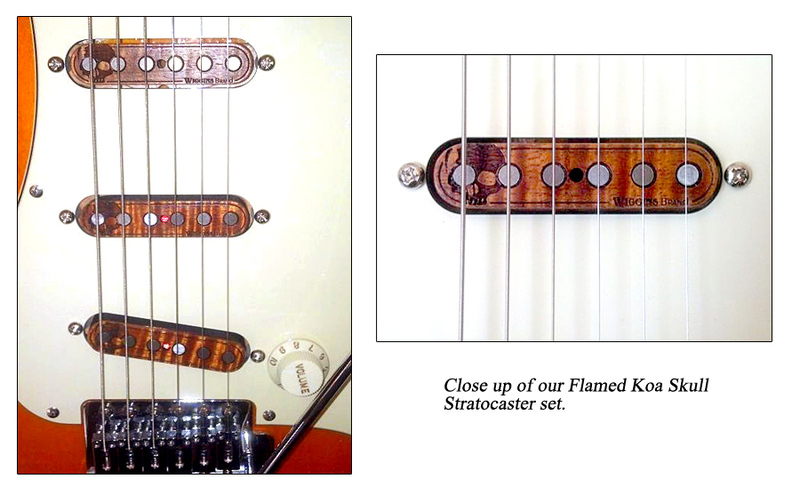 Below are a set of amazing custom guitars by Robert Wood Guitars with various Wiggins Brand pickups. 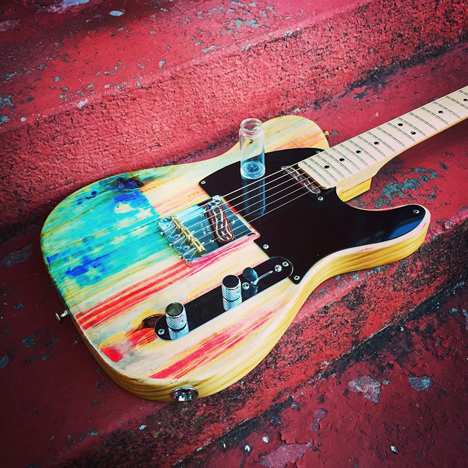 These unique guitars are beautiful works of art in their own right. 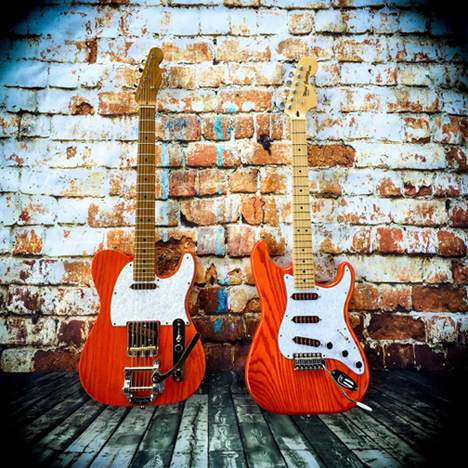 From bright, vibrant classics, to wear worn themes, we're proud to be able to work with this great luthier. 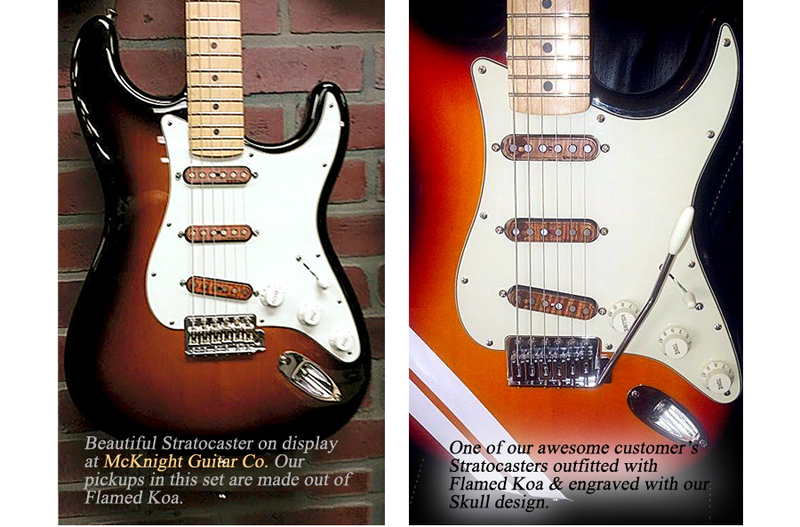 Left: Ebonized walnut with our "surf longboard" design with gold leaf inlay strat pickups. Top: An American Beauty! Hand painted and reliced American flag engraved design tele pickups. 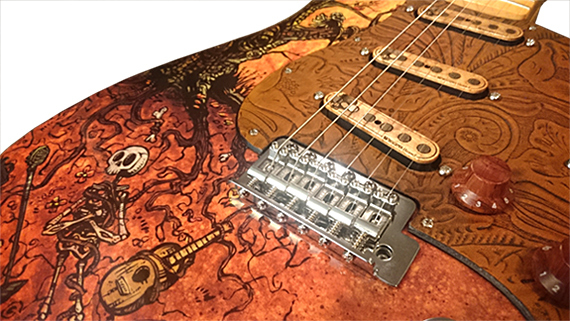 Awesome parts-caster created by Darrell Braun featuring our Strat HSS set made from flamed maple with overwound winding for this special project. 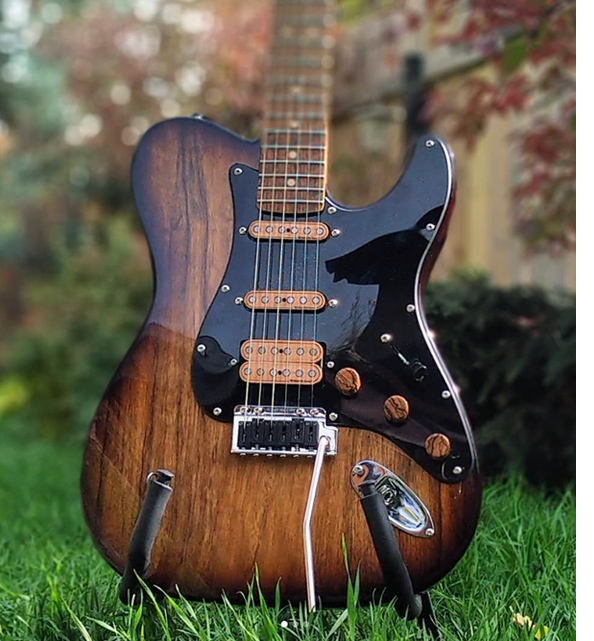 This humbucker is coil split with a 4 connector lead, and has alnico 5 magnets for sound and tone, standard to Wiggins Brand pickups. 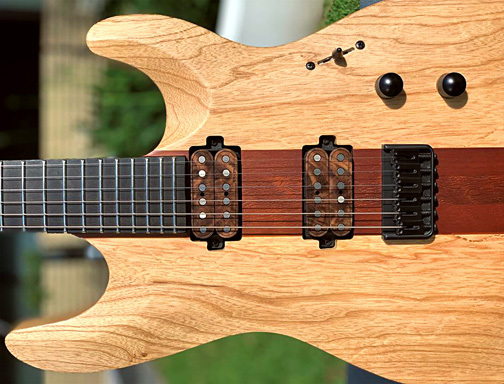 Check out the creating of this great guitar here on the 4 part video series by Darrell Braun Guitar. 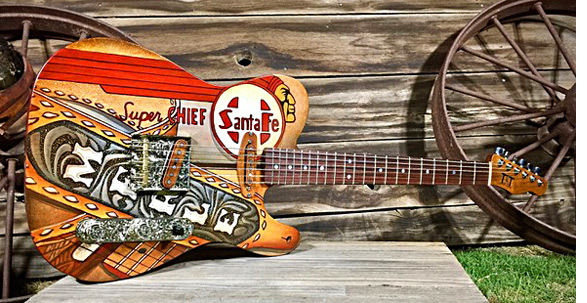 Here's a fantastic custom tribute guitar to Merle Haggard. It made its recent debut early in April 2018 in Bakersfield at the second annual Merle Haggard Boxcar festival. Builder, Tony Brown, got to show it to the Haggard family and members of his band at the festival. We're honored to have been chosen to provide the pickups and matching wood ring for this amazing piece of artwork! 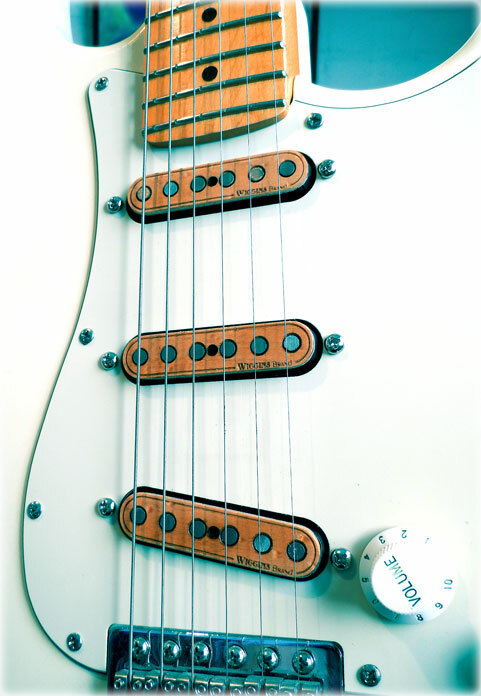 Above: A couple of different humbucker sets. 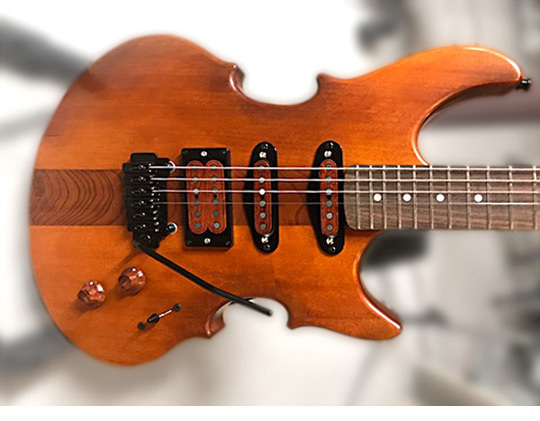 The set on the right has been installed in a Rob Wrobel CBG original, with our first custom three string mini-humbucker in walnut. 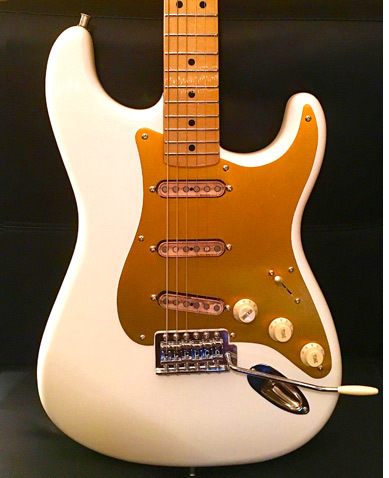 Example of a beautifully shaped custom guitar by Ken Spawton. The C-shaped "bouts" transform this beauty into a one of a kind, gorgeous violin-like figure. 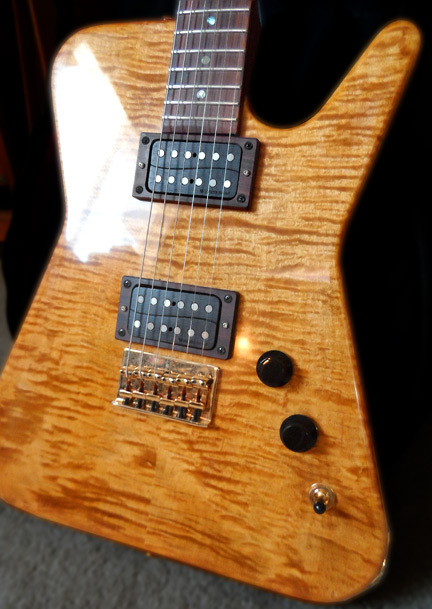 We created the humbucker (HSS) set sound our customer needed and finished it in a matched color tone padauk wood. Stunning! 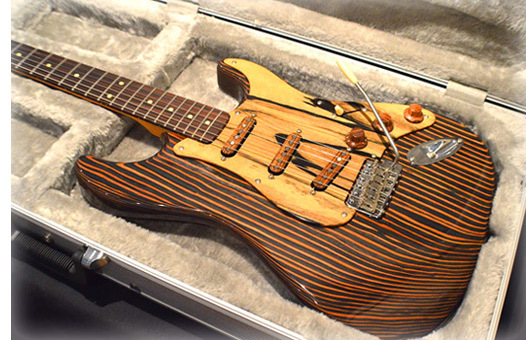 Incredible custom Zebrano body guitar was made by luthier Michael Couling of California Artist Guitars, UK; home to some of the most amazing vintage-look guitars and unique custom designs. Go check him out! I thought you might like to see the build that your pups ended up in the UK, I have decided to keep this build for me !! This set along with the Zebrano body sound stunning, sustain..well...hit a note and you have time to make coffee before it stops, incredible, thanks Bill for a 1st class job and a 1st class pickup. 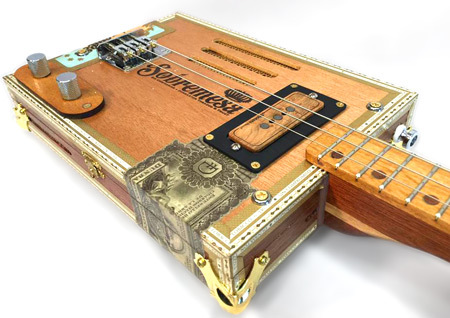 Above: Luthier Rob Wrobel, made this cool cigar box guitar named the "Sobremesa", and outfitted it with a Wiggins Brand maple three string CBG pickup. 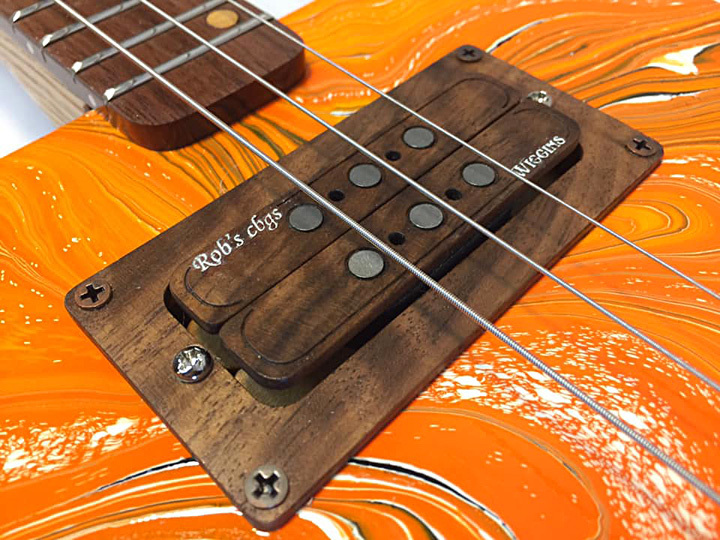 Check out more of Rob's amazing CBG guitars for sale on his selling page on Reverb. 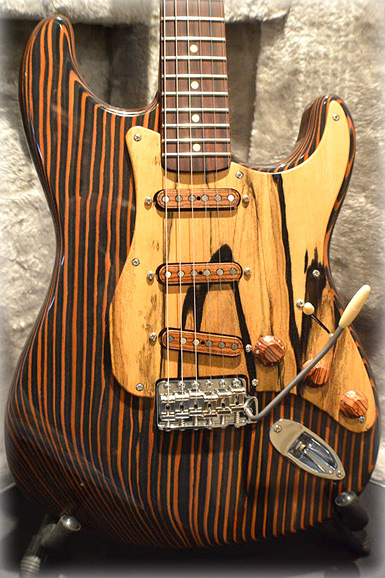 Right: Beautiful guitar made of "tiger stripe" maple by Luthier Doug Shelton of Tucson, AZ. outfitted with custom spec and custom designed Wiggins Brand "wave" humbuckers in ebonized walnut. 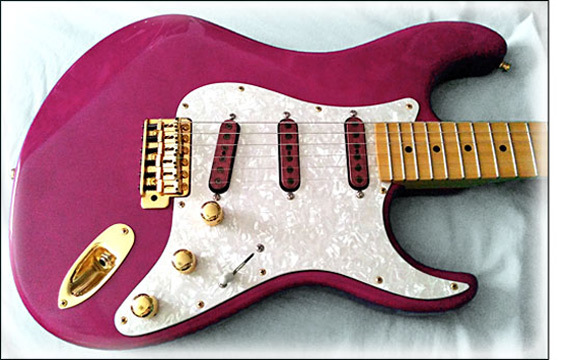 This cool relic (below) goes from "old" to "BOLD" with a pop of color on our custom hand painted, orchid pink and blue "Long Board Relic" style single coil pickups. After long wait due to our postal services turtle pace, your (now mine) pickups have arrived. They were installed by my technician along with a 4-way switch mod and I feel obliged to share my impressions. The pickups are built to perfection and reflect true craftsmanship and a work of art. The tops are beautiful maple, mate finish, minimalist, exactly to my taste. The wiring and base plates are excellent quality. 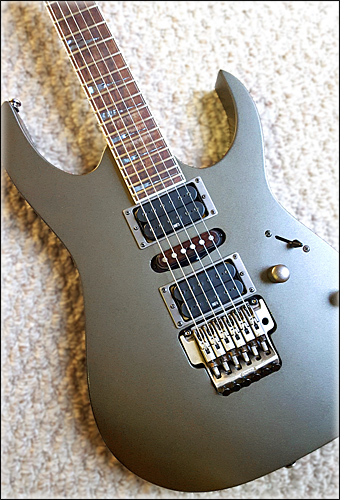 Nothing to compare with the replaced form factor pickups. Like I stated in our correspondence before placing the order, this was my biggest factor and somewhat concern, since there are not many HQ sound reviews for Wiggins on the net, comparing to other brands. These pickups DELIVER, and then some. The bridge pickup is outstanding. So good it plays clean very smooth and does not bite. With gain it really shines. Took away most of the country sound, just like I have asked when you recommended which type to order. 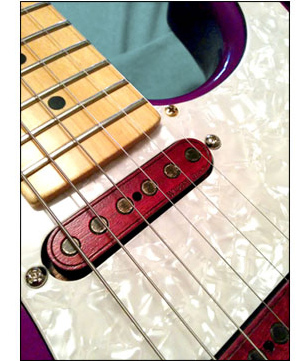 The neck pickup is so good… A real leverage from the stock pickup. Round and full sound. Pure bliss. The 4th mode gives an awesome boost and is a real killer. I feel that my Tele became a Rock Tele, which is exactly what I wanted. The pickups are very silent, even comparing to my 4th gen. noiseless I have on my Strat (we'll speak about the Strat in the future…). All in all, I am completely happy from the pickups and they exceed my expectation so thank you very much. This beauty from Wm. 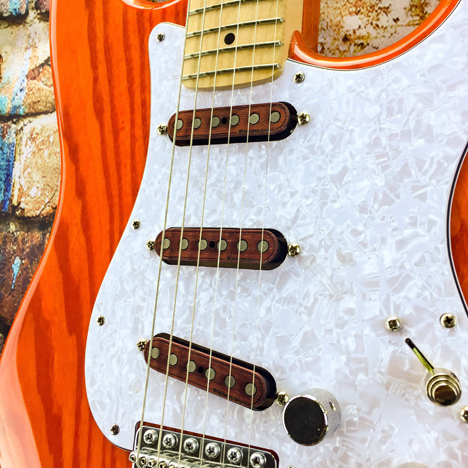 Bergman is a custom American Stratocaster by WEB Guitars, showcasing a gorgeous example of mixed warm tone woods on a juicy red body. I got the pickups yesterday. My first impressions upon receiving them were great. Your packaging was neat and very well designed. I appreciated the attention to detail. The pickups look outstanding. Last night I got them soldered in and they are Absolutely Great!! They took My Strat to a whole new level. However, there is a funny side to my first impressions playing them, it wasn't good. 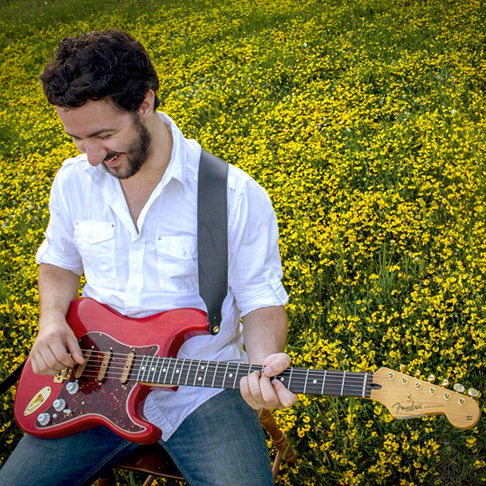 I sat down plugged my guitar in and started playing with great anticipation. Unfortunately, what I was hearing was hallow sounding, way to bright and shrill. I was disappointed. 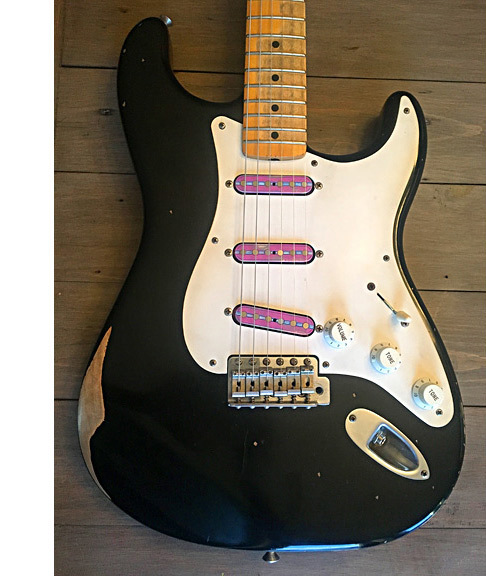 I played for about 10 or 15 minutes constantly switching between pickups, adjusting the tone knob and nothing would change what I was hearing. So I stopped and in my mind retraced my wiring thinking surely I did something wrong, but how? The wiring was simple. Then I saw the light...Literally, I saw the light on my wah pedal. Some how accidentally turned my Wah peddle on and had it toe down. I had a moment of feeling like an idiot, which I should be used to, it happens often. With the Wah OFF, I quickly realized just how amazing these pickups are. They Just Blew me away. And of course....they sound great with the wah when its intentional. 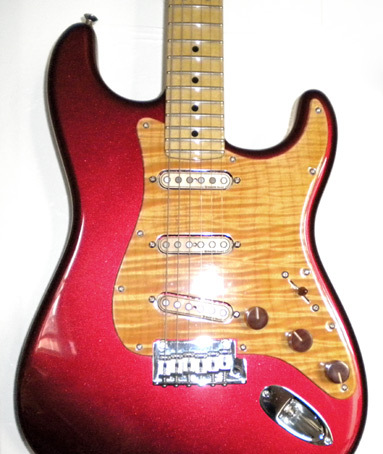 :) I'm attaching a pic of my guitar with the your Fabulous pickups. It is a Squire Classic Vibe that I picked up at a local shop. I have been slowly modding it into a great guitar. Thus far I have Replaced the Nut with a Graph tech Tusq, Replaced the Bridge and Block, and of course, best mod yet, Wiggins Pickups. This awesome Strat was put together by a recent customer who wanted a great tone and look to match the feel of the detailing and color of the neck, so we chose Birdseye Maple with our signature skull design. 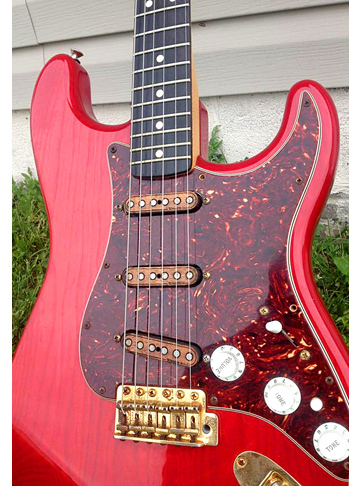 The result is an awesome combination of super cool creative body design, and warm, one-of-a-kind soulful tone. 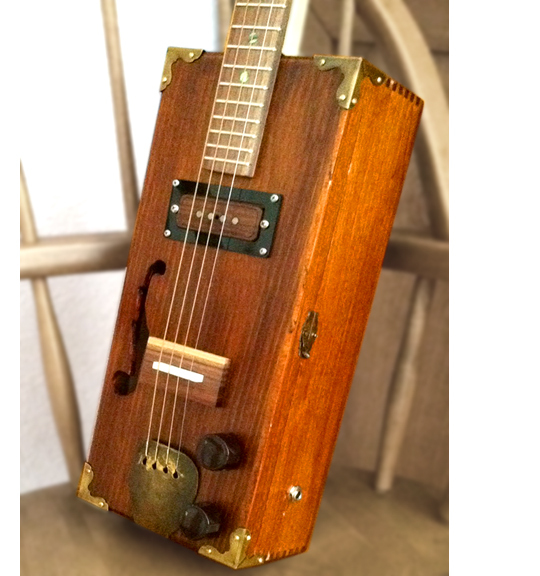 a custom Cigar Box Guitar outfitted with one of our walnut 4 string pickups and black acrylic mounting ring. The details on our customer's build are exquisite; from the brass tailpiece and accents, to the beautifully scrolled f-hole. 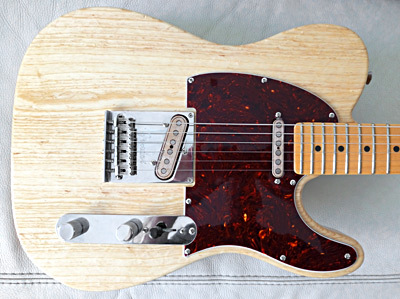 An awesome CBG with a great vintage, yet modern feel. 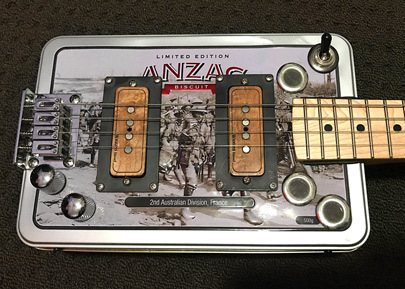 Below is a fantastic upcycled piece from a cool ANZAC's tin, outfitted with matching 4 string pups. 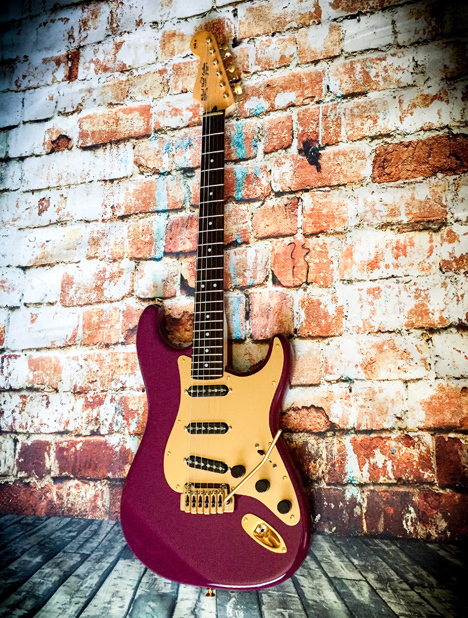 Set of Purpleheart strat pickups in a Tagima brand guitar with the perfect shade of purple. 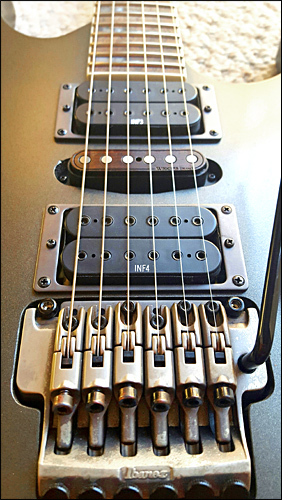 "Hello, I installed my new pickups Saturday afternoon and spent quite a while trying them out this weekend. I was a sales manager at a Guitar Center for several years and I've tried just about every pickup you can think of from a major manufacturer. After I went though all of the Seymour Duncans, Dimarzios, etc. I tried many of the boutique makers and small shops. There are a lot of really nice pickups out there but nothing that comes close to the set you sent me. These really are the best sounding single coils pickups I've ever used. They're also really beautiful and I can tell you put a lot of attention into making them. You're a true artist, and I'm pretty sure you make the best pickups on earth. I look forward to trying more in the future. P.S. - I love that you use solid wire one these. So easy to work with!" My Ibanez actually sounds like a Strat which was the goal but I did have my doubts honestly. I haven't used the stock humbuckers, they are so muddy compared to yours. 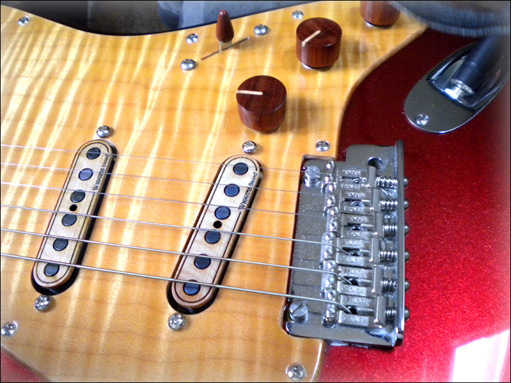 I notice my switch is locked on the Wiggins pickup versus the two Infinity Humbuckers (which are going soon). I'm sure you get this part all the time that it looks beautiful but not only that the smell is great too. Like I'm playing a Strat around a fire with a bunch of people. Keep up the great work you all are doing. Check out the latest pictures attached with the black cover. 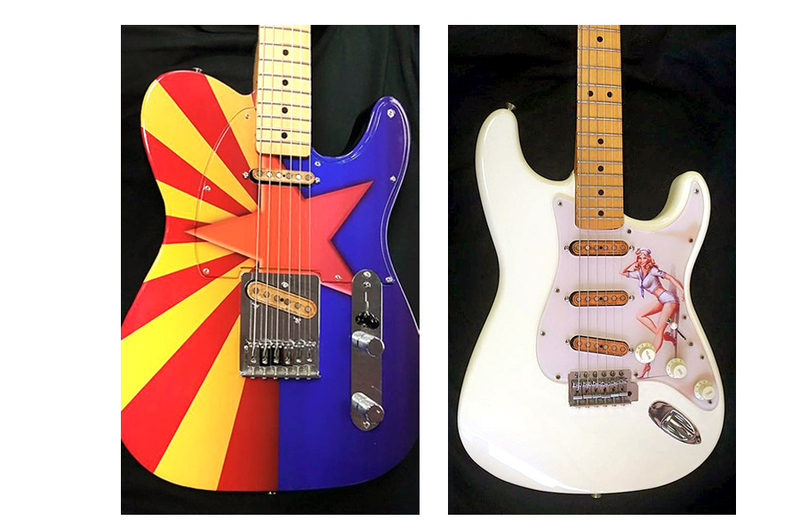 Gorgeous custom Fenders from our customer in Arizona. 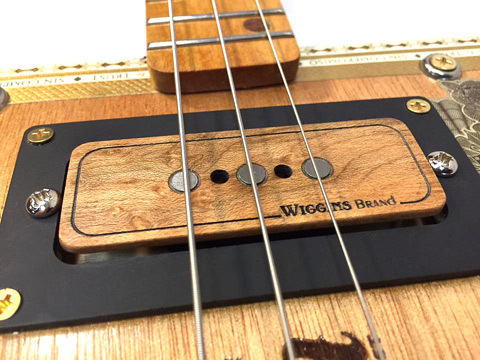 Wiggins Brand Pickups in Birdseye Maple. 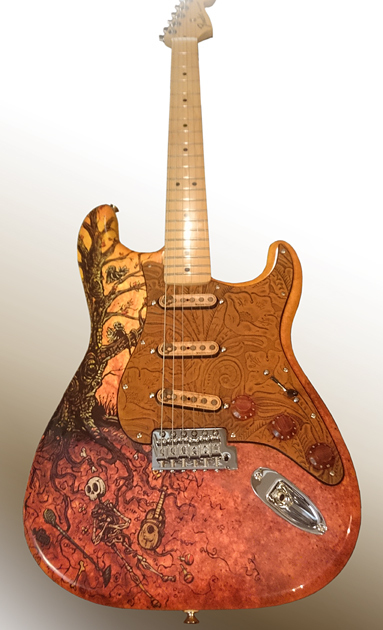 Ray Flanagan's Strat with a beautiful Flamed Koa pickup set.